I have come to the conclusion that if you are running KDE Plasma and you don’t have a great experience with it, you are somehow doing it wrong. 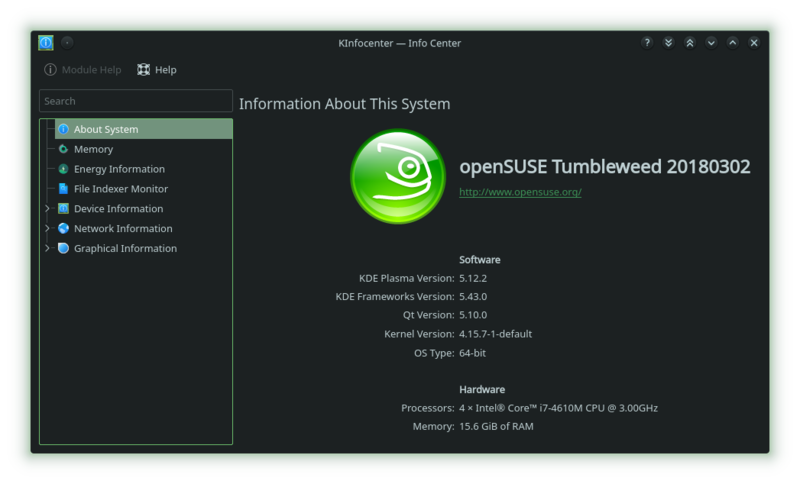 Version 5.12 has been a great on openSUSE Tumbleweed and it is a challenge to not excitedly recommend Tumbleweed with KDE Plasma to anyone and everyone. It’s fun playing with the new shiny while not having concerns over system stability of other rolling distributions. Admittedly, the changes between 5.11 and 5.12 are not blatantly obvious and I think that is a wonderful thing. There are no surprises, just a number of new, small, but super useful improvements to the system. Since I am running openSUSE Tumbleweed this part is really rather dull and uninteresting as openSUSE just doesn’t seem to have problems with updates, thanks to openQA and all the fine engineers that work on it. Should there be an issue with an update, it is just as easy to roll back upgrade and wait a bit longer for issues to be worked out. Outside of that, it was a very uneventful upgrade. I am incredibly biased in favor of KDE Plasma so I do have some rose tinted glasses here but here is the order from least exciting to most exciting changes for me with version 5.12. Media controls are accessible from the lock screen. It’s handy to be able to start or stop whatever is playing but it has to be something that is “plugged into” the Media Player applet. I don’t see a way to configure it but I do know that Amarok, VLC and Dragon Player “talk” to it. I don’t seem to play media like I once did but regardless, this is a super handy feature and I am glad it is there. Access to volume control from the lock screen. I have used this more than once, allowing something play too loud on my machine, the screen locks, someone walks up to you to talk and now I can lower the volume quickly or even just mute the audio. This works regardless of the media source. Media controls are accessible from the lock screen. It’s handy to be able to start or stop whatever is playing but it has to be something that is “plugged into” the Media Player applet. I don’t see a way to configure it but I do know that Amarok, VLC and Dragon Player “talk” to it. I don’t seem to play media like I once did but regardless, this is a super handy feature and I am glad it is there. The ability to mute an application by right-clicking on the task bar application, much like muting tabs in a browser. This is a fantastic feature I never knew I wanted! The KDE team is absolutely not allowed to deprecate it, ever! It is a feature I use regularly when I just want to kill the audio from an application. The 30% speed improvement is genuinely perceivable. I can’t take measurements from before to now but this speed improvement is very real. Unless if I am pushing my machine, running multiple VMs, my machine just doesn’t lag or bog down. KDE Plasma has this raw, yet solid feel to it. From the time I stopped using my Amiga 4000T as my daily driver, I had always thought that everything I had used since had a persistent delay, albeit slight and easily dismissed. Specifically, opening a file manager, application menu and restoring something from the task bar, there was this ever so slight hesitation. I don’t see that hesitation anymore. It is as though the bridle has come off of my horse! First, I would like the granular control over the Desktop Theme as you once had in Plasma 4. I could mix and match themes to my content. That is no longer available. I am guessing because KDE Plasma has often taken a bit of criticism by being to complicated, the feature was never reintegrated after the switch to version 5. Second, the Numeric, Currency and Time Formats are not as straight forward as they once were. I would prefer to define my settings, not with regional descriptors entries but with defined drop downs and string entries of KDE 3 and KDE 4. I knew exactly how the information was going to be displayed. Third, I do wish there was more emphasis on ensuring dark themes work well on all applications. I can’t pin this on anyone else as this is something I want and I have the freedom to get involved in any project that I want to tweak so this is a small issue. KDE Plasma is pretty awesome. All the features, the customization options and efficiency makes it my primary desktop of choice. If you can’t make KDE Plasma work for you, you are clearly doing it wrong. This is not as to dismiss or undervalue any of the other desktop environment options available. I believe it is the multitude of choice that forces all the desktops to be better. Just because KDE Plasma is great, doesn’t mean the other desktop environments are not, they can all be great.